Started: March 2010. Finished: June 2011. 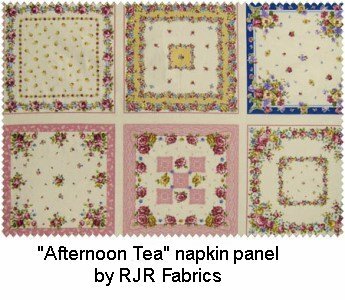 This project was started in March 2010 and I assume it was at that time I found a panel of luncheon napkins from RJR fabrics' line "Afternoon Tea". Our youngest dear daughter (DD#3) is all about Victorian stuff and vintage dancing and afternoon teas. RJR's line of napkins fairly screamed her name to me. There were 6 napkins per panel and I bought 2 panels, for a total of 12 napkins. How do YOU hem your single layer cloth napkins? 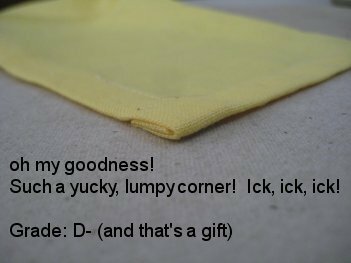 When hemming single layer cloth napkins, you can do it the quick and dirty way that results in a nasty, icky, horrid LUMP at each corner. Don't do that, I implore you! the preferred technique: With just spending a little more time and effort, you can have beautifully mitered corners that are FLAT. a mitered corner, front and reverse: . Here's a tutorial for napkin mitered corners: How to do a mitered corner for a napkin (No webpage, just a downloadable tutorial in PDF format). The pink scallop on the left side is from yardage and looks vaguely 1940's -ish. The body fabric is an off-white tone on tone (which is also used as the binding). 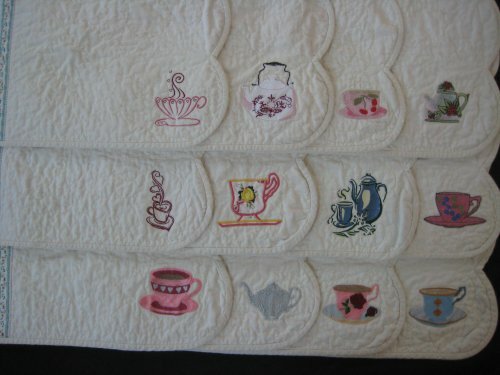 I've machine embroidered a different "tea party" design in each corner of each of the 12 placemats. 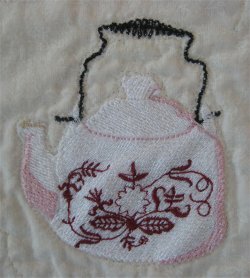 Many of the embroidered designs are very dense. 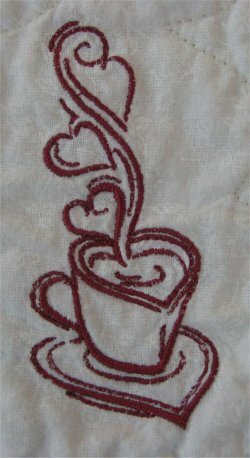 I have found that even with proper stabilizers and hooping, densely stitched designs tend to "cup" the finished product. I definitely did not want that. This photo shows how the design "cups" on the tulle. It would do exactly that on fabric as well ... EVEN IF you had the proper stabilizer. I suppose that if you had super-stiff stabilizer, the stitched design could be flattened out but then the finished project would be stiff as cardboard. After pondering the problem, a solution presented itself: hoop water soluble stabilizer and stitch the design on tulle! After stitching, the stabilizer will wash away, the tulle can be trimmed closely and the resulting "free standing" embroidery can then be *appliqued* to the base fabric without distorting it! And that is *exactly* what I did for all of the very dense designs! You can see with this photo that the stitched design is absolutely flat-flat-flat! Actually, there are two methods you can use: applique the stitched design with the tulle still attached then trim the tulle afterwards OR trim the tulle away first and applique along the trimmed edge. Either way will work. 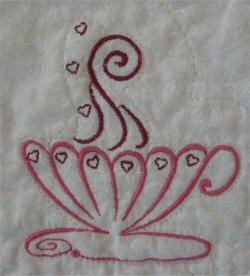 This photo shows the stitched design after being appliqued to the body fabric. You can vaguely see the edges of the tulle, as I have not trimmed the tulle in this photo. Here are all the designs that I used. When possible, I am providing a link to the digitizer so you can obtain the design for yourself. Please be aware that most of these designs were freebies; they may not *always* be available. from Golden Needle Designs. Originally on the website, this design has been moved to their Yahoo group. As you can see, this design has MANY elements to it. This is a superb example of how a talented and knowledgeable digitizer makes it possible for all of the elements to FIT together properly. There are NO gaps or spaces between any of the elements. This design was such a joy to stitch out. from Hatched In Africa. I can't find this design on their site. 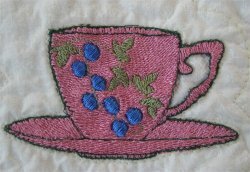 from Oregon Patchworks, Rose Cottage Embroideries. This design is at the bottom of the page. 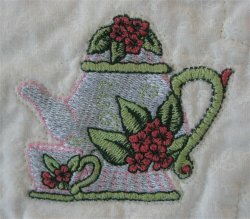 from Oregon Patchworks, Rose Cottage Embroideries. 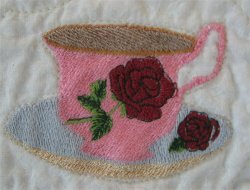 from Rose Cottage Embroideries website. 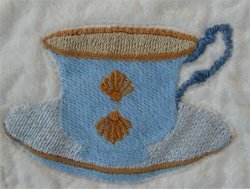 There is a "teapot alphabet" on the Oregon Patworks, Rose Cottage Embroideries page that coordinates with this teacup. 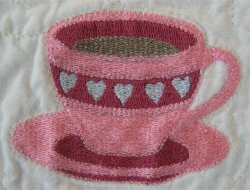 from Rose Cottage Embroidery website. This is part of a tea service set, consisting of a tea pot, creamer and sugar dish. 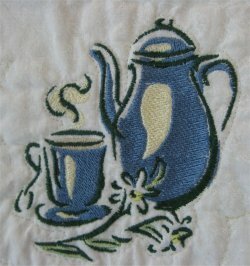 Let me say, at this point, that ALL of Rose Cottage Embroidery design stitch out *SUPERBLY*. Vivian is an extraordinarly talented and skilled digitizer. 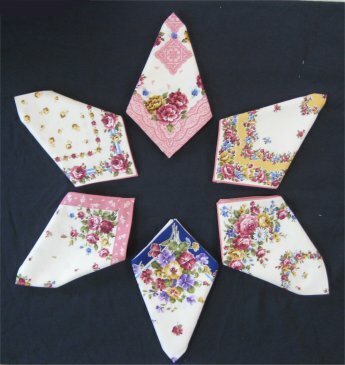 You can see that her designs have many separate elements that fit together fantastically. There are *no* gaps or separations between them. 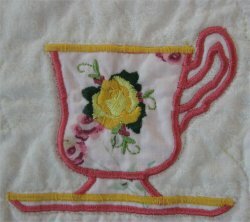 If you stitch out any of her designs, you can be assured that you have a first-class embroidery. from RP Embroideries. Sadly, the website is no longer in existence. This is a prime example of snagging that design when you see it because it just may not be there later on! 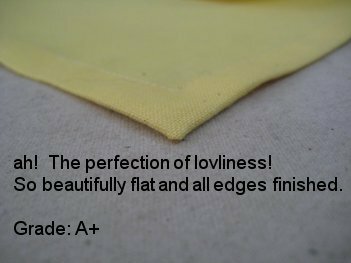 Most of the designs offered at Sew Forum are by non-professionals, so the quality varies greatly. This design is example of how the elements of the design do NOT fit together nicely. 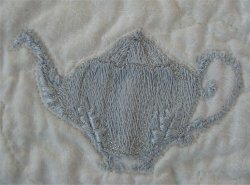 There are wide gaps between outlining stitches and the teapot & teacup. also from Sew Forum, but sadly, I wasn't able to locate it. 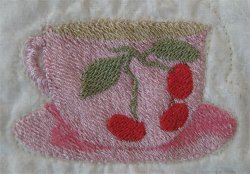 Secrets of Embroidery, "A Bit of Stitch" design. This was part of the Secrets Of Bonus-A-2007 Summer.zip file which was available when a certain dollar amount was spent. This zip file is no longer available. 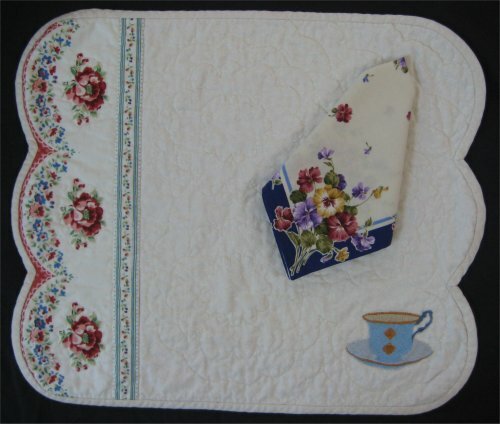 And how about the quilting? 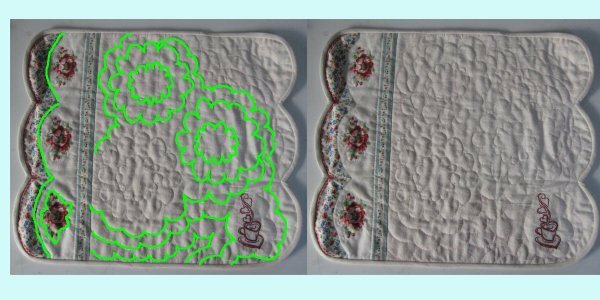 The quilting is was marked with Saral transfer paper in yellow and free-motioned on my home sewing machine. The yellow Saral was marginally difficult to wash out; a normal wash with soap didn't work at all. I spritzed it with Oxy-Clean and that worked wonderfully. I'll probably think twice about using the yellow Saral again. Normally, I sew my binding to the back of the quilt, flip it to the front and machine top-stitch it in place. I *know* that the machine stitching will hold better than my hand-stitching! But because the placemats had scallops and I've never had good results using that method with scallops, I applied the binding in the traditional manner: sew it to the front, flip it to the back and hand-stitch it in place. Stitching binding for scallops is more exacting than any other kind of binding. When you are stitching the binding to the front, you need to clip the fabric and pivot where the scallops form a "V", otherwise you won't have a neat finish. Also, where the scallops form a "V", I do try to miter the binding front and back .. sometimes I have reasonable results and sometimes I don't. 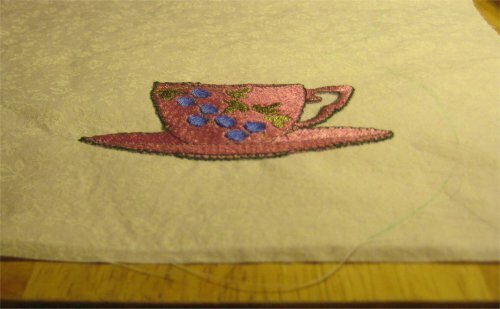 To help me with the task of hand stitching the binding to twelve placemats, I used "Colonial's "ThimblePad" instead of a thimble. I have never mastered using a metal thimble ... leather thimbles (with the metal disk at the tip) are better, but eventually the leather stretches and even the small size will slip off my finger. When I discovered the ThimblePads, I was skeptical, but after using them with these placemats, I now think they are just the cat's pajamas! When the sticky part wears off you can buy replacement adhesive pads. They really do work at protecting my poor abused fingertip!